Since it's LGBT month, I just had to read at least one of David Levithan's books, because he was technically the only author of YA LGBT that I knew of before doing some searching of my own. I'd heard mostly nothing but praise for Leviathan's books, so I decided to give Boy Meets Boy a go. Unfortunately, the book did next to nothing for me and I didn't finish it. 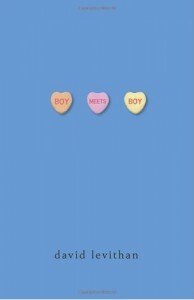 Boy Meets Boy is about Paul, an openly gay boy who lives in a town where everyone is accepting of the LGBT community and meets Noah, the guy he is sure is the one for him. And that's pretty much as far as I got to. Not even halfway. I was just so freaking bored by the clichéd storyline that takes place in an unbelievable utopia inhabited by bland and sometimes annoying characters. I did try to give this book a chance a couple of times, but I just wasn't getting anyway with it to the point that I just gave up completely. One of the biggest problems I had with this book was its setting. While the idea of an all-accepting town/school is a wonderful idea, I didn't like the way that it was pulled off. It just seemed far-fetched to me. I was incredibly confused as to why Infinite Darlene was still the quarterback on the football team, since she now identifies as female. Surely she wouldn't be able to play for the team anymore, which would be exclusively male. And here's another thing: Paul's kindergarten teacher wrote on his report card "definitely gay". A student's sexuality is none of the teacher's business. And a kindergarten teacher should definitely not be figuring out the sexuality of five-year-olds. I'm pretty sure that goes against child protection guidelines or something like that. Basically, the book's world felt like that gif where a stick person is puking a rainbow onto another person's face. It would be nice to have a world like this, but seriously, be realistic about it and calm the crap down. Although I didn't really get to any real romance, I couldn't feel any chemistry between Paul and Noah at all. There was neither any spice or fluff. I didn't even feel any of the feelings associated with falling in love, mainly because I was so blinded by boredom and the figurative chunks of rainbow puke in my eyes. I do kind of understand the point that you can replace either Paul or Noah with a female character and it would feel exactly the same, but the whole utopian concept made it just boring and stale, it was just like something I'd seen plenty of times before. I just couldn't make it through Boy Meets Boy. I couldn't take any more of being bored and slightly annoyed by the baffling utopia that the book is set in. It's possible that if I managed to push through, the story might have gotten better, but I can't really see that happening. I might return to this some day, but for now I'm marking it as DNF.